IMPORTANT: If you upgraded Photoshop on a Mac and the plugin stopped working you will need to uninstall it and re-install it (watch the video) but it will work! IMPORTANT: If you upgraded Photoshop on a Mac and the plugin stopped working you will need to uninstall it and re-install it (video here and details here) but it will work! 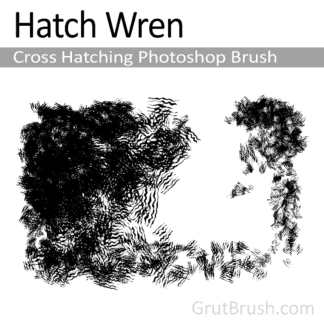 Note: This plugin is optional and not required to use GrutBrushes. You can use them in CS5 and up without it like this. A Photoshop plugin (Photoshop CC 2014/15/17) that puts your GrutBrushes into a panel right inside Photoshop! Thumbnails For All Your GrutBrushes Tool Presets! Unlike Photoshop’s abr panel you could place an oil brush, a mixer brush and an eraser all in a row. Mix and match toolset types to your heart’s delight. Keep your panel tidy without deleting brushes. Just hide the ones you don’t need until later. This quick tutorial will show you how to install the Photoshop plugin in less than a minute. Zip Tip: If you have downloaded an individual brush in a zip file you can add the zip as is. No need to unzip it first! 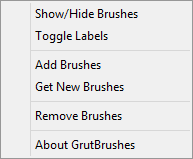 Install the latest GrutBrushes via the internet, directly from inside Photoshop! 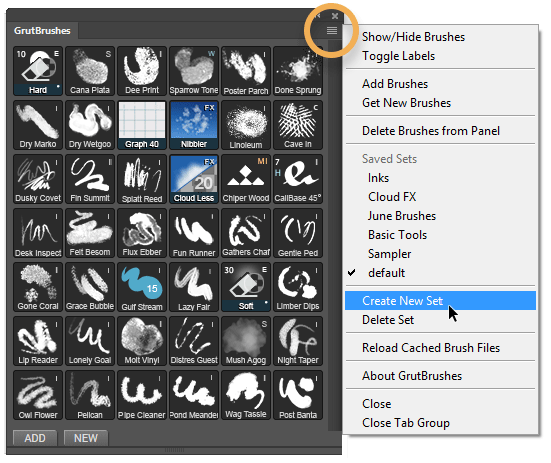 If you purchased any brushes or have an active GrutBrushes membership you can add and install brushes directly into Photoshop via the GrutBrushes plugin panel using the “New” button. Guests can also ‘instant-install’ freebies and the free Photoshop brush of the week directly from inside Photoshop using the GrutBrushes plugin panel. If you updated Photoshop recently and your plugin stopped working, you will need to uninstall it and re-install it. I love it so much! Thanks Nicolai! The brushes themselves are fantastic. However, this extension has a few issues in the latest version of Photoshop that make it (in my opinion) worse than the regular tool presets panel. First, the default maximum height is ridiculously small (about one-third the height of my 1080p monitor), with no options to resize the panel vertically. Interesting to note, you can resize the panel horizontally as much as you want. I would love to be able to stretch the panel down the height of my entire screen, to be able to see as many tools at once as possible. Secondly, Photoshop doesn’t treat this plugin’s source as a “trusted script,” so seemingly at random it will deactivate the plugin (a deactivated plugin can still be used, but it isn’t able to affect low-level Photoshop functions and, most importantly, its context menu is disabled–which makes it impossible to show/hide brushes, create new sets, etc). I saw a reply from the author saying that the solution was to re-install the plugin, but this doesn’t always work–Photoshop will occasionally remember that it deactivated the plugin and the plugin with already be deactivated on first load. If you have further questions feel free to email me as I would prefer to leave this area for reviews. Thanks for understanding. I’m sorry for the negative email, I just got your response. I guess you either pick to reply to or you just reply to questions and concerns for those who have purchased you product. I am in serious doubt about purchasing your brushes and panel because of that. I sent you 3 emails yesterday and no response and looking at all the questions and comments dating back to 2/12/2016, I see only 3 responses. What’s up with stuff? I see most of you reviews are from people using windows, does anyone use Mac OS (version 10.13.4), if so, what kind of reviews do you have with them? Regarding my last inquiry, my PS cc is version 19. Is this panel having real problems installing and using? I have read the reviews and it does not look so good. Before I buy these brushes, how many come with the $20.00? From what I see is a few and your facebook ad states over 240, what’s up? I am using a iMac and a MacBook Pro with High Sierra os, is it compatible with this hardware and software? I also have PS CC on both computers. As for the plugin, if you’d rather not, you don’t need to use the GrutBrushes plugin, the brushes will work just as well without it. 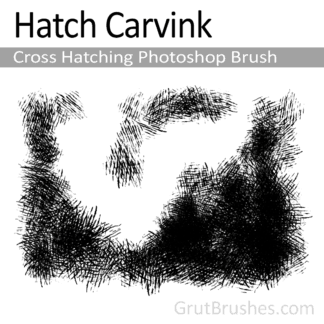 I just offer it as a free gift to help Photoshop CC artists organise their grutbrushes if they want to. A few people have had a hard time installing it but most people manage it in a minute or two You can watch me install the plugin and the sample set brushes in about 60 seconds in this video here. You can try it for yourself for free if you’d like. I’m not sure where you are looking that you see only a few brushes, there are actually more like 350 Photoshop brushes in the set now (over 400 if you count the high res pencils as separate brushes— but I don’t 🙂 ) As for the price, they are intended for professional artists and while $20 is a lot of money in an abstract sense, it’s a tiny fraction of a small portion of what an artist will make on even a minor job. If you can’t imagine that they could be worth $20 then I don’t think you will find these brushes valuable to you. There are plenty of free brushes on the site, you should probably go for those instead, I think you will like them. You can also come back every week and download at least one new one for free. Thanks for asking Bill! Unfortunately that version is too old, the oldest version the plugin works with is v.15 (which is confusingly called Photoshop CC 2014) Adobe changed the way their plugins work completely with Photoshop version 15. Sorry I don’t have better news but don’t forget that you can use any GrutBrushes without the plugin just fine in the Tool Presets panel. Photoshop plugin fixed! Thanks Nicolai! Very useful tool. Yesterday I installed it and navigated through all the option, like how to create presets. Today, the menu (3 stacked horizontal lines) does not show absolutely anything, only the “close” option. Moreover, the right click on individual brushes does not display anything. I have the latest version of PS CC and I am working on Windows 10. Is anything I should do to recover the full functionality of the plugin? I love your plugin so much! However, may I have ver 1.1.1? 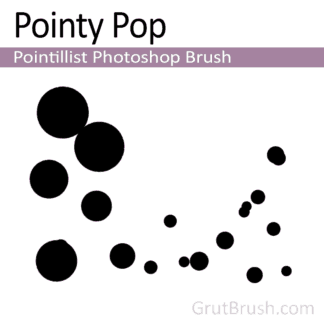 If you just want to use the GrutBrushes in Photoshop CS6 you can do so like this. I’m afraid I’m no able to install it on the Photoshop CS6 version, is there a way to solve this problem please? Thank you for creating such a useful plugin. Unfortunately for some reason it does not work. I am using Windows 10 64 pro, Photoshop CC 2017. I am able to see plugin installed successfully. I am able to open it and id does appera on my panel. I can’t upload any brushes. Process : Add Brushes -> navigate to zip file with brushes -> load. Nothing appears in GrutBrushes panel, it does not through any error massage , just nothing happens. I downloaded brushes from this website. I tried to reinstall plugin. Restart Photoshop. Restart PC. I am not sure what is going on. If some one has similar issue please and fixed please let me know. If you have any recommendation let me know as well. Thank you for your time. Great selection of brushes – plug-in makes it easy to use and organize brushes. Thanks, Nicolai! Just a question regarding cloud brushes. Do they go only with PS CC? Been using with Windows 10 and Photoshop CC. Works great and an easy way to switch and access brushes. I only just discovered Grutbrushes recently and have already started using them. Furthermore, I was keen, like John, to add some of my favourite brushes. I converted one .abr I love into a tool presets and also created a .PNG file for it. The naming code seems fine (I used ‘GrutBrush-W-Blablabla’) and the brush adds, but when clicked on it gets stuck on ‘line 312’, if that’s any help. I love the panel and I’m very excited to use it anyway. Great work and thank you! Keen to see if you have a ‘User Brush’ section in your next update. All this is based on V1.2.1, Windows 10, Photoshop CC 2016 (updated). Very Handy! I like to be able to just load your brushes I use all the time and access them with your abbreviated tool preset panel! Thanks for keeping us organized! Very useful to see and organize the tools. Thank you!